When one talks about Vračar‘s sights, one firstly associates it with the St Sava Temple. 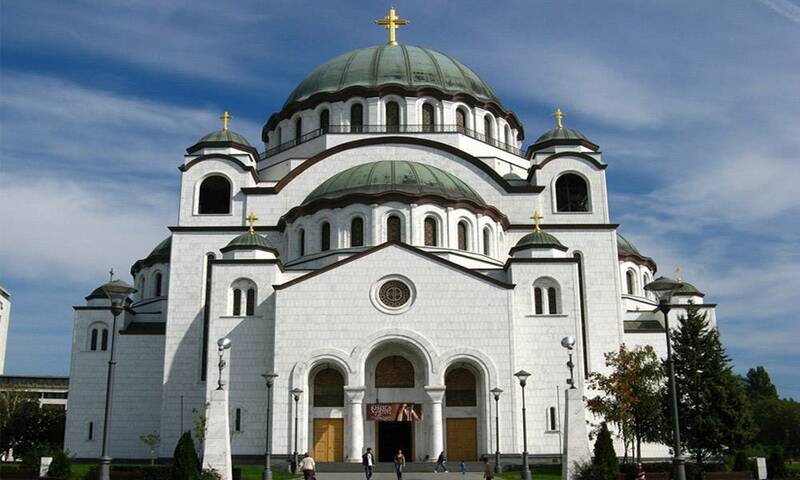 This Orthodox temple is the biggest one in Serbia and one of the biggest Orthodox churches in the world. The idea to build a temple in Vračar dedicated to Saint Sava dates from the early 1895. The Association for Building the Temple was founded in 1895 and decided to build the temple at the place where, allegedly, the body of Saint Sava was burned (the exact location is still unknown). This was decided on the tercentenary since the burial. However, forty years passed from the idea to its realization. This was due to the failed initial architecture tenders, the Balkans war, the First World War and many other factors. The act of building the temple was awarded to the second-placed bidder in the competition of 1926 (the first place was not awarded for unknown reasons) architect Bogdan Nestorović (he designed the buildings of Tanjug and Zanatski dom (Artisan home), current building of Radio Belgrade), and the second hired architect was Aleksandar Deroko. The act of building started in 1935. Since it was a large project, it was believed it would be finished in ten years’ time. However, the whole process stopped due to the Second World War and the Communist rule after the war. Building the Temple continued in 1985, which is exactly fifty years from the start of building or ninety years since the original idea. The Temple is still being built. The Temple’s area has a capacity of 10000 people, the Temple itself has 49 bells, and the dome’s height, together with the gilded cross, is 82 m in total. The dome’s weight is impressive 40 tons and it has eighteen crosses on it. The main cross is on the coat of arms of Vračar municipality. The National Library of Serbia is just next to the Temple. This library was built after the original library at Kosančićev venac was bombed on 6 April 1941. In the Temple’s immediate vicinity, there is our apartment Ciao, a three-room luxury apartment directly overlooking the Temple’s plateau. Also, there is apartment Terminal, a two-room luxury apartment with a spacious balcony overlooking the Temple. Also, the following apartments are very near the Temple: Hram, Lila Lux and Orange, as well as a three-room apartment Kruna. Another luxury apartment, which has a Jacuzzi bathtub, is near the Temple and across the Karadjordje’s park – apartment Topflat. Karadjordje’s park is interesting for several reasons. Namely, there used to be a camp of Karadjordje’s insurgents who started the fight to liberate Belgrade from the Turks at that very place in 1806. This place was the burial place of the killed Serbian insurgents after Belgrade had been liberated. Several monuments keep the memory of this event. The biggest monument is the one in front of the plateau of St Sava Temple, built in 1979, which shows Karadjordje facing the park named after him. Another interesting part of Vračar is Slavija. Slavija used to be Belgrade’s periphery, which had fields and a large pond. The start of constructing Slavija is credited to a rich Scot who came to Belgrade at the end of the 19th century and stayed here for twenty years, until his death. His name was Francis Mackenzie and it was him that a nearby street was named after. Mackenzie, who worked for the English embassy in Belgrade, decided to buy the marshy land in Slavija for a large sum of money, dry it and divide into parcels. Then, he started selling the parcels at a very favourable price, which prompted people to settle the area. The whole part of Mackenzie’s land is nowadays called Englezovac (although he was a Scot). After some time, a tavern called Slavija was opened in these parcels. The whole square was named after it later. Today, there is a parking space on the place of a former tavern, which was later a cinema. It is interesting to point out that the park at Slavija was formerly known as Mitić’s hole because there was a hole in that place for a long time. Vlada Mitić, a pre-war merchant wanted to build a large department store in that place. However, the war and the communist rule prevented him from doing so since the communists took away all of his property. Only the foundations of the not-meant-to-be department store remained in that place, which was a hole in Belgrade center for decades. The following studios are near Slavija: City, Marmelo, White and Barcelona. Apart from these apartments, there is also a two-room apartment City Max in Južni Bulevar street and Apartments Čubura and Harmony in Čubura. Apartment White Owl is very near Kalenić market, which was named after a shoemaker and merchant Vlajko Kalenić, who owned a land parcel in that place which he bequeathed to the city. In 1926 the market was built in that place. The complete offer of apartments in this location can be seen in category Apartments in Vračar.